Autumn is such a beautiful season as all the trees change color and it’s also the season to enjoy delicious fall inspired recipes. These cookies are grain free, gluten free, and dairy free so this recipe can work for many types of diets, including paleo. We’ve also included a variation of the recipe to make it completely sugar free, by using monk fruit sweetener instead of coconut sugar. Pumpkins are so much more than Halloween decorations or a Thanksgiving pie filling, they are loaded with health benefits and can be used in such a wide variety of recipes. Pumpkin is one of the best sources of the powerful antioxidant beta-carotene. Once eaten, your body converts beta-carotene into vitamin A and studies have found it may reduce the risk of certain types of cancer, as well as delay aging and body degeneration. Pumpkin can also help with digestion, as it’s a great source of fiber. In addition to that, its high fiber content can help regulate blood sugar as fiber slows the rate of sugar absorption in the blood, which can help prevent blood sugar spikes caused by sugary desserts. 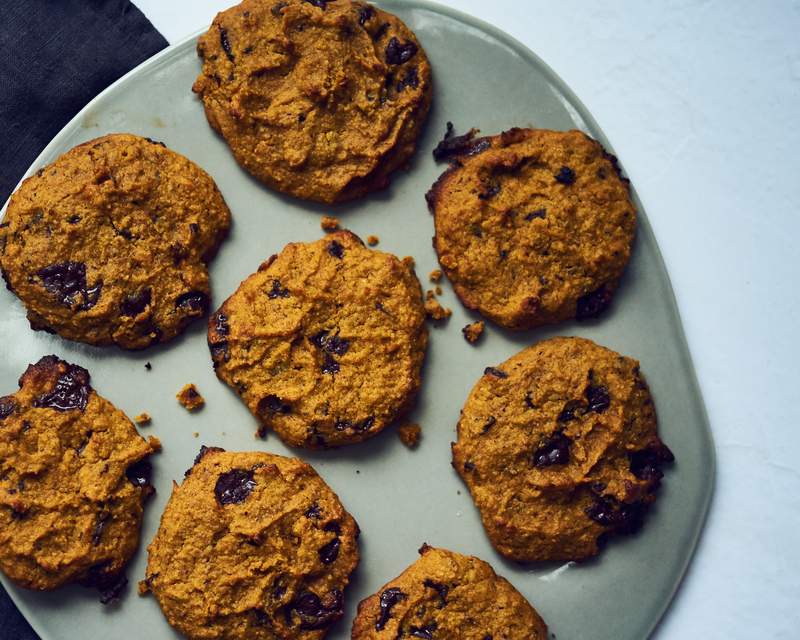 What better way is there to incorporate pumpkin into your diet than in cookies!? Instead of using grain-based flours, this recipe includes almond flour as well as almond butter. Almonds are low in saturated fat and rich in monounsaturated fats that have been associated with reducing risk of heart disease. In addition to that, almonds contain antioxidants and are a good source of plant based protein. These nutrient dense nuts (as all nuts are) provide important vitamins, such as vitamin E, and minerals, such as magnesium. We promise these will be your new fall favorite cookie recipe! If you give the recipe a try, let us know and share a photo on Instagram or Facebook (tag us @livingkitchenco), we’d love to see! In a mixing bowl, whisk together the egg, almond butter, pumpkin puree, coconut oil, coconut sugar and vanilla. In a separate mixing bowl, combine the almond flour, sea salt, pumpkin pie spice, and baking soda. Once you mix the dry mixture together, slowly mix it into the wet ingredients until combined (it is a more liquidy batter than average cookie dough). Lastly, stir in the dark chocolate. Scoop out around 1 Tbsp of the mixture for each cookie on the baking sheet. Bake for 10-12 minutes or until just set. Remove from oven and allow the cookies to sit and cool completely.